It has been awhile since my last post, still recovering from Halloween mayhem I suppose. I have been enjoying the autumnal crispness settling into my bones, gladly awaiting the darkness of winter and the time of candlelight and ghosts. But what about the daylight hours? I had an interesting radio interview the other morning during which the host, Cleveland Rippons, asked me if I had any recent paranormal encounters, and if they were a regular thing for me. In all honesty the most vivid ones I have had I had as a child, before logic or cynicism set in. Still, I have had a few in my adult years. My answer to him was just that–my adult apparition sitings paled in comparison to those experienced by some of my more psychic and gifted friends, and were certainly not as clear as those I had as a child. Shortly after I hung up the phone with him, I heard a series of odd noises coming from my kitchen. Pings and taps. Distinct. Strange. I felt a little ripple of a chill down my spine. Ghosts come in unlikely forms, not always under cover of night. Sometimes they come to remind you that you aren’t as far away from them as you’d think. At 10 in the morning, on a bright sunny day. Here is a story submitted to me for my first book. The Book of the Bizarre by a friend of my editor’s who heard I was looking for paranormal stories and asked if she could share it. It reminded me of something that had happened to me as a young child, and remains one of my favorite ghost stories from the book. And it is a ghost story from the light of day. Dana was the youngest of four kids, living in an old Victorian house in the Minnesota suburbs. Her grand-father, who lived in the same town was sick in the hospital, but Dana was too young to really know what was going on or that he was dying. 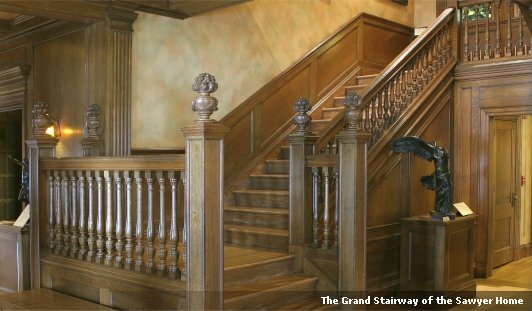 One day while her mother was at the hospital, Dana came walking down the grand staircase in her house. To her surprise, she saw her grandfather walking up toward her, looking healthy and happy. “I wanted to say good-bye, Dana, and I love you very much,” he said and continued up the stairs. Delighted, the child raced into the kitchen to tell her mother that Grandpa was all better and that he’d come over for a visit. But her mother had just returned home from the hospital with some bad news–her grandfather had passed away earlier that afternoon. This entry was tagged afterdeath, death, ghost, paranormal, supernatural, The Book of the Bizarre. Bookmark the permalink. I love your books and am a huge fan of the weird and paranormal. Do you have anything new coming out or that you are workling on? My new blog is about the same topics as I have had some odd happenings throughout my life and know of others who also have interesting stories so it seemed a natural. Hi. I have been working on a new project soon to be announced. It is a little different from my first two books but very cool and ultra-paranormal. Thanks for your kind words!